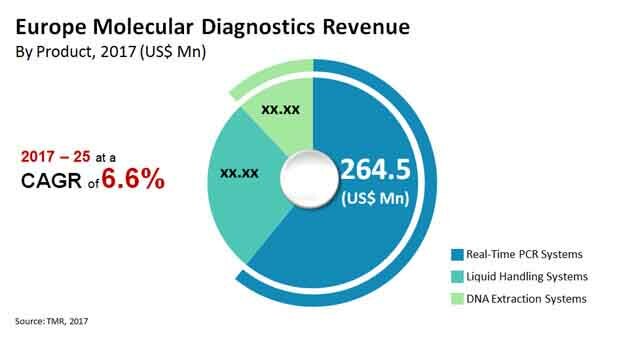 The Europe molecular diagnostics market is slated to grow exponentially during the forecast period which is 2017 to 2025 due to intense competition between several market players, reports Transparency Market Research. The competition in this market is mainly due to a rise in automation in the research technology. Prominent players in the Europe molecular diagnostics market comprise Dickinson and Company, Bio-Rad Laboratories, Agilent Technologies, Becton, Eppendorf AG, and F. Hoffmann-La Roche Ltd. These leading players are emphasizing on venture capital investments to strengthen their position in the Europe molecular diagnostics market. Additionally, they are working on product customizations to expand their revenue shares in the market. The Europe molecular diagnostics market is expected to rise steadily at a 6.6 % CAGR during the forecast period. The market is anticipated to be valued at US$769.0 mn by the end of 2025 rising from US$769.0 mn in 2016. In terms of product, the Europe molecular diagnostics market is segmented into liquid handling systems, DNA extraction systems, and real-time PCR systems. Out of these, the real-time PCR systems dominates the market and is expected to hold a leading position throughout the forecast period. This is owing to the benefits it offers over primitive real-time PCR systems. On the geographical front, Germany dominates the Europe molecular diagnostics market. This is on account of the recent developments in the biotechnological sector. Additionally, increasing investments in the healthcare sector have boosted the Europe molecular diagnostics market’s growth in this region. Rising investment in research activities has contributed to a great adoption of molecular diagnostic devices in the pharmaceutical sector. This has impacted the Europe molecular diagnostics market positively, thereby propelling its growth. Moreover, increasing private and public funding for the research and development activities has expedited the market’s expansion. The PCR conferences conducted by Europa Organization is one of the many initiatives supporting the growth of Europe molecular diagnostics market. Along with the aforementioned drivers, rising healthcare expenditure is expected to drive the market’s expansion. Additionally, growing awareness about chronic disorders rising availability of diagnostic centers is expected to spur the Europe molecular diagnostics market’s growth. Moreover, rising incidences of chronic diseases and hospital acquired infections could drive the Europe molecular diagnostics market’s growth. On the downside, there are a few restraints that may thwart the Europe molecular diagnostics market’s growth. Governments of several European countries are concentrating on reducing the fiscal deficit. This has led to fluctuations in the research and development budget, thereby posing a threat to the market. Nonetheless, high demand for point-of-care diagnostics that provide rapid results is expected to give a thrust to the market’s growth. Additionally, key players are engaging in strategic mergers and acquisitions that facilitate the strengthening of Europe molecular diagnostics market’s growth ground. Governments of European countries are taking several initiatives to promote the use of molecular diagnostics. For instance, European Personalized Medicine Association is offering funds to train healthcare professionals in using diagnostics. These training programs are focused on the use of personalized medicines. In addition, the European Alliance for Personalized Medicine (EAPM) conducted a conference that aimed at growth opportunities in the healthcare sector pertaining to new therapies for patients. These initiatives have provided a major thrust to the Europe molecular diagnostics market, thereby creating new growth prospects.